Colorkitten's Action Blog: Best. Tarot. Deck. Ever. 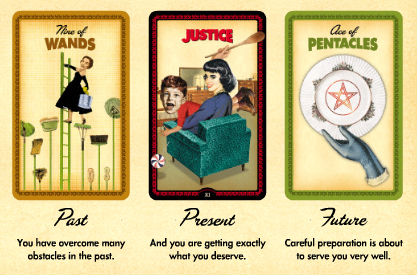 My galpal Mary discovered this incredibly cool retro-licious Housewives Tarot and it only took me about 2 minutes to add the (real) deck to my Amazon shopping list! You can also do a reading right on the site, which is pretty fun. Here's my reading! how in the hell were you able to save your reading!? i right clicked and the 'save this image' feature wasn't available! No, actually, I just used the print screen function and then pasted it into photoshop. print screen function? Is that a right click? oh! what does it matter! i don't have photoshop anyway!!! blah! !